Md. legislature ‘would be a lot worse’ for business if not for Senate leaders, Kasemeyer says. 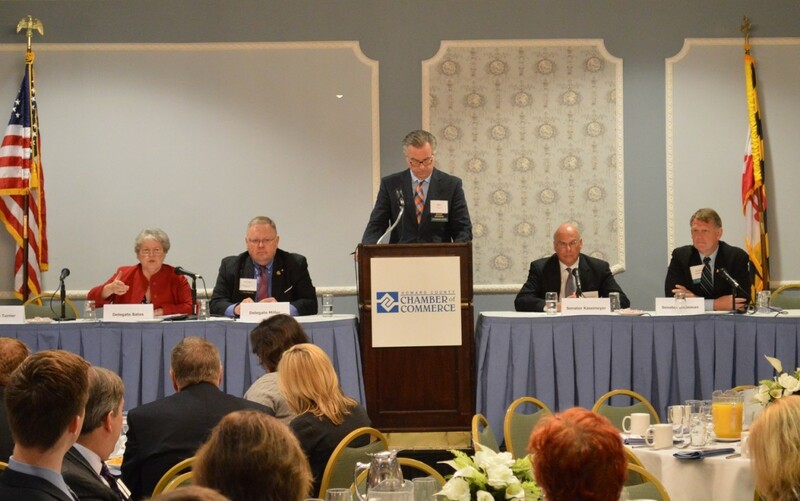 At its annual legislative wrap-up session April 30, the Howard County Chamber of Commerce heard from Dels. Gail Bates and Warren Miller, moderator Mike Fowler of BGE, Sens. Ed Kasemeyer and Allan Kittleman. “If it weren’t for the more moderate leadership in the Senate, things would be a lot worse than what they are” in the Maryland General Assembly, Sen. Ed Kasemeyer told Howard County business leaders Wednesday. Kasemeyer, Democratic chairman of the Senate Budget and Taxation, said on business issues like combined reporting and the minimum wage that leaders like himself are keeping progressive forces at bay. Kasemeyer was addressing the annual legislative wrap-up of the Howard County Chamber of Commerce, a group in which he served as president in 1980 before his election to the legislature. Sen. Allan Kittleman, a Republican running for Howard County executive, agreed that the minimum wage “could have been a whole lot worse” for business interests. On the minimum wage, for instance, the Senate Finance Committee on which Kittleman serves changed the House version to raise the wage to $10.10 over a longer period of time and exempted more workers. “It was a whole lot better than when the governor brought it in,” said Kittleman. He also said it was remarkable that Senate President Mike Miller referred to the need to reduce Maryland taxes when he supported higher exemptions for the estate tax. Kasemeyer, typically laid back but tight lipped in Annapolis, was more forthcoming to a friendly home audience. He said he continues to fight repeated legislation by liberal Democrats to institute “combined reporting” for corporate taxes, a method that uses the percentage of sales in a state to calculate taxes on profits. Kasemeyer said the vote in his committee continues to stand 7-6 against combined reporting, mainly because he asks his vice chairman, Sen. Nathaniel McFadden, D-Baltimore City, not to vote for it even though McFadden supports it. “That’s what we’re fighting off,” Kasemeyer said. “Keeping the status quo is sort of a victory down there,” as he contends with the pro-labor legislators from Montgomery and Prince George’s counties and Baltimore City. “He’s telling you the way it is,” said Kittleman, a former minority leader of the Senate. Kasemeyer said a “sleeper occurrence at the session” was the formation by the Senate president and House speaker of a new Maryland Economic Development and Business Climate Commission headed by former Lockheed Martin chairman and CEO Norman Augustine. “I see significant legislation coming out of it,” Kasemeyer said. The commission held its first meeting Wednesday. He said his committee would be focusing on reducing income taxes on pass-through business entities such as subchapter S corporations, which pay no corporate taxes but whose partners pay personal income taxes on profits distributed to them. A high-ranking Ehrlich administration official and former Republican candidate for Howard County Council has filed an ethics complaint against Howard County Executive Ken Ulman and County Council Chairman Calvin Ball. Diane Wilson says Ulman and Ball used their offices to get her fired as the lobbyist for the Howard County Chamber of Commerce after serving just a week in January.